Margaret shared the financial statement to date. The yearend financial statement will be prepared after the end of January. Camrose and District Support Services will be able to provide some grant monies again this year, but the amount will reduced due to their budgetary restraints. Various Augustana Student Association groups are collaborating in planning and hosting Pride Week. 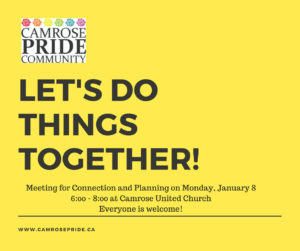 Wayne and Carol are on the planning committee to represent Camrose Pride Community. There will be a Bake Sale held during the week (day to be determined) and donations of baking would be appreciated. Camrose Public Library will be planning to host some events and decorate the library in recognition of Pride Week. A Glam afternoon will be hosted at House of Hair Design from 2:00 – 4:00 p.m. on Sunday, February 25. Everyone is invited to come and experiment with their makeup and costumes in preparation for So You Think You Can Drag. So You Think You Can Drag will be hosted at the Bailey Theatre on Friday, March 2. The Augustana Learning and Beyond office contacted Wayne and asked if we would like a Community Service Learning student to assist with Pride Week. Wayne accepted the offer on behalf of Camrose Pride Community, but at this time we do not know yet who it will be or when they will be starting. Wayne and Margaret will begin work on the Not for Profit Status paperwork in February. 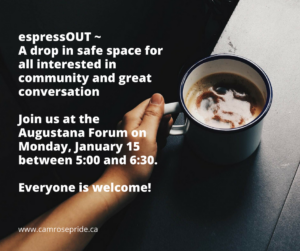 espressOUT has had great turn out since moving to the Augustana Forum. There was discussion about trying out some other community venues for espressOUT to be more visible in the community and show our support for those businesses who have been supportive to us. We also discussed whether or not to move the time from 5:00-6:30 p.m. to 5:30 – 7:00 p.m. No decisions were made at this time. There was also discussion about whether or not to continue to meet at Camrose United Church for our regular meetings and whether or not this may be a deterrent for some people. We discussed other potential venues such as Camrose Public Library. All meetings will remain at the locations and times as advertised for now, but we encourage others to express their opinion to the Leadership Team (Wayne, Gus or Carol) as to locations for our meetings before a decision is made as a group about any changes. Big Valley Jamboree Parade: The group agreed that the entry in the Big Valley Jamboree Parade in August was very successful and we would like to enter again this year. Consider handing out information related to the Prime Minister’s recent apology to the LGBTQ community. Planning for the Parade entries needs to start very shortly. If you are interested in working on this committee, let the Leadership Team know asap. Community BBQ: Discussion about different ways to do a simplified BBQ event perhaps at a downtown location as a fundraiser. All Ages Dances: We have received very positive feedback about the All Ages Family Dances that we have hosted. Should we be doing more of these? Community Registration Night is a good opportunity to let the Community know we are active. Marnie Panas will be the guest speaker at Camrose United Church in the spring. We will be hosting another Expressive Arts Night on March 5. We will attend the Augustana Human Library from 6:00 – 7:00 p.m. on Monday, February 5 and then follow this with a short meeting just outside of the Augustana Faith and Life Chapel. Google Calendar has now been included on the Camrose Pride Website. Jen will post 3 months at a time. Send any dates that need to be posted to Jen. The Photo Gallery is going to be going live soon on the website. Please send any photos to Jen and make sure that permission has been obtained by those in the photos. Our First Meeting of 2018!